You will find Lorella Springs Station 29 kilometres north of the Savannah Way, between Borroloola and Roper Bar in the Northern Territory. Access to Lorella’s homestead and station is getting easier every year, thanks to continued upgrades and improvements to the Government maintained gravel/ earth road which links the Savannah Way to the Lorella homestead. Having said that, road conditions will always vary depending on which time of year travelled, for example after the wet and for the first few weeks that we are open (early April) you should definitely expect some mud and water crossings. Although the road is classed as 4WD drive, when taking it slowly and with care most vehicles and caravans should have no problem being able to travel through. A phone call to the Station for a road update is always a good idea (08 8975 9917). If you have your own aircraft, feel free to use our airstrip, which is located only a short distance from the homestead campground. We can arrange for our team to pick you up from the airstrip. Please make sure you contact us in advance. See the “Airstrip” section further below for more details or visit our dedicated page for details about FLYING TO LORELLA. When flying to the Northern Territory you can hire a 4WD car from Darwin and make your way down to Lorella. Lorella is all about the wild, nature and adventure. But over the years our numbers and dynamics have changed and increased and we appreciate that not everyone requires the same level of comfort or choice of bugs when staying with us. In order to allow all our lovely guests to enjoy the remote wilderness without it becoming an endurance test, we have developed several types of accommodation to offer at Lorella’s homestead main campground: camping sites, deluxe bedrooms or self-contained cabins. With a property so big that you could fit 5 times the city of New York, you can only imagine how extensive our campground is. With bathroom facilities including flushing toilets and hot showers, shady trees and good drinking water in the taps throughout the campground, you will feel just like at home on our campground! There is no need to book your camping or caravan space at Lorella. Just drive in, stop by the office for registration and to receive some information about what’s been happening at Lorella and the latest must do’s for your stay, then head across the creek and find your perfect spot. Once you’re all set up, why not have a taste of our Magical Springs before heading to the bar and enjoying the company of our friendly hosts at happy hour (4:00pm – 6:00 pm). We suggest spending a night or two in the main campground to get a feel of this majestic land during small day trips, before becoming more adventurous and enjoying some remote camping. Over the years, as we have been opening new tracks and beautiful destinations for you to discover and explore, we’ve tried to clear some areas for our guests to be able to enjoy their day fully and camp at those amazing locations that we have across the property. This is remote camping and very basic with just a cleared area but no bathroom facilities. In addition you are allowed to camp almost anywhere on the property. All we ask is that you take care not to leave any rubbish behind, that you are extremely careful with fire, and that you do not camp too close to rivers due to salt water crocodiles, or too close to the water on the beach (because of sharks and crocodiles). And remember, NO HUNTING! And just as important, please make sure you have completed our Sign Out form before leaving the homestead so that we know who is going where and coming back when. At the homestead campground, we now have four self-contained cabins to offer you. Each cabin includes a queen-size bed and a single bed and offers air-conditioning as well as a private bathroom, satellite TV, mini fridge, and a private BBQ. Bedding and linen are provided. Do contact us to check availability well in advance for our Bedrooms as most of our rooms are already booked and confirmed for the season of 2018! All our accommodation (cabins and bedrooms) are strictly NO SMOKING. Pets are not allowed in our accommodation. Check-in is from 12 pm and check out at 10:00 am. Any late check-out must be confirmed with our office staff first, as your room may already be booked again for that day. Booking is essential and full pre-payment is required at time of booking, for all stays in our cabins, safari tents or bedrooms. To make a reservation, please email your booking request to mail@lorellasprings.com. Our 16 Deluxe bedrooms include a ceiling fan, mini fridge and own bathroom. Rooms are setup with either a queen bed or two single beds. Bedding and linen are provided. Once on-site, you will be greeted and looked after by our friendly staff who will give you all the information in regard to directions you may need to make the most of your stay and your adventures at Lorella, with a choice of hundreds of kilometres of 4WD tracks ranging from basic to more extreme tracks with creek crossings, boggy and treacherous conditions. With new accommodation in operation, meals and bar facilities, the beautiful Magical hot water spring and so many beautiful places to visit locally within a short distance of the main campground, a 12,000 metre long all-weather airstrip has been built at a convenient location near the homestead campground. Please note that the airstrip is not yet certified, but still usable. Please note that we require a phone call or email 24 hours before arrival to confirm your time of arrival, as we may have other aircraft’s in the air on that day. We might be in the bush; however we do have flushing toilets and hot showers! There are several bathrooms facilities across the campground, all with flushing toilets and “Donkeys” heated with fire to make hot water. But how hot the water will be could depend on you… so make sure you check the fire is burning before you jump in, and it is always a good idea to collect extra firewood while you are out on your travels across the property! It is true that Lorella is a bit remote, actually it is very remote, but that’s no need to worry, you will not die from dehydration. Yes we do have a licensed bar and some very friendly hosts to make it more fun, along with other interesting personalities to keep you company and share your days adventures. There are also meals available, or if you would like to give it a go there is a communal campfire, where, by the way, most of us end up sitting and chatting into the night. Or feel free to use our camp ovens to make something yourself. We have basic food supplies, tea and coffee, big flat screen TV for the footy… or Home and Away! You will hear the bell sounding around the campground. Yep… along comes four o’clock. Our Happy Hour (4:00 pm-6:00 pm), at the bar or around the fire seems like a good place to watch the setting sun, maybe have a coldie and chat to part of the family, or a regular… or maybe get some updated info from our office while watching Lorella Film clips. We also have movie nights, and our famous big cook ups, where we get the whole campground involved. When it gets later, it is not unusual for people to make their way down the hill and swim in our lovely hot water springs and watch the stars, to finish off the perfect day. With so many remote and diverse landscapes, it is no wonder that Lorella has so many varieties of wild birds. From the unexplored and wild gulf coastline, hundreds of kilometres of fresh water creeks estuaries and rivers, thick scrub, open savannah, swamps, billabongs and lagoons through to the more rocky mountainous country with remote escarpment and hidden springs abundant with life where possibly no white man has ever set foot. In the past 15 years since we have opened Lorella to the public, 160 different species of birds have been spotted and recorded – during our 2016 season alone, 15 new species were added to our list! So take your chance at finding new species or just enjoy the diversity of those we have with the help of our mud maps and directions supplied by our staff as well as our very comprehensive Lorella Springs Bird Watching List which is also available for download. With a million acres of space to camp, there is no need to book your camping or caravan site in advance at Lorella. Just drive in, stop by the office and we will help you out with directions, information and getting you started on your adventure. For cabins and deluxe bedrooms, however, we do require bookings. To book accommodation, please email your booking request to mail@lorellasprings.com, or give us a call in advance on 08 8975 9917. Please note that full pre-payment is required at time of booking for accommodation, and your credit card will be required at check in for security deposit. For those of you who are passionate readers – Lorella offers a book swap library in the office. Bring your own and exchange it for free with our selection of novels, biographies and other genre available. Some reference books remain the property of Lorella Springs and must remain in the bar area. As Lorella is so remote and so large, with over 4,000 square kilometres of wildernes, most of the destinations accessible to the public to date I have originally discovered during a walk. Then with the help of my family and helpers like yourselves, at a later stage, we have managed to get access with a track. With maps and directions, there are many walks to hike starting basic with easy access close to the homestead campground with basic fitness levels, through to some more advanced half-day and full day walks which will require fitness and a knowledge of the bush. Then, there are the parts of Lorella where no man has set foot before, to explore, discover and maybe have a new location named after you. Your safety is our first priority. While walking we remind you of the dangers of being in such an area i.e. crocodiles, buffalos, scrub cattle, wild pigs, dingoes, lack of water and disorientation to name a few. Please ensure that you take plenty of water with you as well as food and snacks, a hat and sunscreen. And just as important, please make sure you have completed our Sign Out form before leaving the homestead so that we know who is going where and coming back when. With the diversity of customers that travel through Lorella, not everyone is arriving with the same (if any!) equipment to make the best of all the adventure available. Some bring their boats, canoes, quad bikes, fishing gear etc. But some people travel light, not knowing how much fun and adventure Lorella has to offer. Over the years, we have opened more and more places for people to enjoy and see as well as more and more things to do and toys to play with. Even though Lorella can be a very dangerous place and you must be Croc Aware, there are some amazing places where you will be able to swim. Always check with our team first and make sure you have a mud map with you before you leave the campground. Also before any trip outside of the homestead campground, we ask that every party completes our sign out form so that we know who to look for should you require assistance during your day or overnight trips. Don’t forget to sign back in when you are back to the homestead! On some of the waterholes, creeks and billabongs, we have made available for your use some small boats and canoes. All we ask is that you put things back so that the next person can enjoy as well. There is a small punt with paddles on the Eagles Nest Billabong as well as at Crocodile Spring – beautiful for a fish and to catch a Barra, or for a sunset paddle down the billabong enjoying nature. But be sure not to fall in the water… yes it definitely has some ‘Freshies’. There is also a small boat on Snapping Handbag Billabong… No, this one is not for a swim either but the fishing is pretty good. Take a boat ride upstream from the main campground, and only 200 metres up to the Magical Bubbling hot water spring, where the water is bubbling out thousands of litres of water an hour, meandering for almost 100 km to make its way to the mouth of the Rosie and the coast. There is a canoe at Rosie Rapids – fun to swim in the shallows, or paddle quietly along the Little Rosie Creek enjoying the tranquility. At Gate Way Gap Gorge, there is a two-man kayak where you can paddle up into this picturesque landscape and rocky gorge. Enjoy the little freshwater crocodiles as they bob down as you paddle past. If you are a bird watcher you will enjoy paddling around Flying Fox Swamp. Unfortunately NO mobile network has made it as far as our location yet, but please note that we offer a guest landline available from the office/bar at the cost of $1 a minute. Once in the wilderness of Lorella, outside of the main homestead campground, you will have no contact with the outside world at all. We recommend carrying a satellite telephone with you and staying on UHF channel 40 at all times. All reservations for cabins and bedrooms require pre-payment at time of booking. Payment can be made by bank transfer or contact us for alternatives if you are travelling from abroad. All accounts are to be settled on departure, including accommodation (except for pre-paid accommodation), bar tabs and other expenses (fuel, grocery etc.). We take cash or have EFTPOS available in the office. For early departure (before 7:30am) please visit our office on the night prior to settle your account. You will discover that our communal fire pit, located not far from the bar is always burning. This is to encourage everyone to come together and gather around in the evening and share memories talking and laughing the night away. There are camp ovens available, and we always love camp oven cook offs … as long as we get a taste. In the main campground we have fire places available to use with care and respect for those around. Please gather fire wood while out and about on your travels. With remote camping when selecting an area for a fire, please take care and clean around the area beforehand. Please put out fire when leaving and be aware at the dangers and damages that a wild bush fire can create. 4WD driving on Lorella Springs Station, a huge one million acres, surrounded on two sides with National Park: one side with Aboriginal land, and backing out onto the Gulf of Carpentaria. There are so many destinations on this beautiful property to see and things to do. With the Costello, Tawallah and Yiyinti ranges vastly scattering across Lorella’s 4,000 square kilometres this makes for a huge contrast in country variation – from beautiful escarpment ranges through to the coastal wetlands and salt flats. 4WD driving on Lorella will be putting you to the test, and we suggest you come prepared with spare tyres, tools for breakdowns, GPS or compass, water and fuel, and always let someone know which direction you are going and when we can expect to see you back. A permit will be required (which already includes your camping fee) which will allow you to travel across our property. This will be given to you to complete when you first arrive at Lorella, and we will also give you maps and friendly advice and directions. So you want to do some fishing in Australia’s Outback N.T.? You have come to the right place!! With a spectacular and vast coastline, kilometres of rivers and creeks, Lorella Springs offers a huge range of fishing opportunities – from the Pandanus lined fresh water billabongs through to the Gulf and its tropical offshore reefs, estuaries and creeks, mangroves and rock outcrops, which attract a vast range of reef fish, game fish, crabbing, prawn and red claw. There are several fishing spots close to the springs and general camping area. The campground at the homestead is situated on a beautiful natural hot water spring, just perfect for relaxing in. Travellers with caravans or trailers may choose to unhitch here before making their way to the Rosie fishing camp and boat ramp, then down the river by boat to the open sea. Travelling from the homestead, you will require a well prepared 4 Wheel Drive. If towing a trailer or off road camper or van, it is suggested to take it easy on the tracks to the fishing camps. Allow between 2 to 4 hours to either the Rosie Fishing Camp or to the Secret Fishing Spot on our northern river. Both destinations are about 80 km from the camp ground at the homestead. Roof toppers and shallow draft boats under 4.75 meters would be more suited, due to the shallow waters, many rock bar as well as sand flats that make up our rivers, creeks and coastline. Following the Rosie Track you will eventually travel through to the banks of the Rosie. The track runs along the edge of the river for about 6 kilometres. This is a beautiful drive and you can stop, fish or camp anywhere along the way. Common fish you would likely catch across the property are fresh and saltwater Barramundi, Mangrove Jacks, Salmon, Queen-Fish, GT’s, Trevally, Barracuda, and most of the fish caught in the Top End of Australia. Suggested fishing tackle would include poppers, soft plastics, bombers or anything silver for the Queenies. Take only what you can eat while on the property. Environmental “Catch and Release” must be STRICTLY adhered to in order to keep this unspoilt sanctuary in its pristine state. Help us keep this place unique and unspoilt for others to enjoy – take your rubbish with you and back to the homestead when leaving the remote campgrounds. Be croc aware! There are many saltwater crocodiles at Lorella. Do not clean fish on banks of boat ramps. Do not swim in waters you are unsure of. There may not be suitable drinking water available on the track to the fishing camps, so please make sure you take plenty of drinking water with you (you can fill up from any water points at the homestead) and travel with enough food as well as safety gear, spare prop and pin and basic medical supplies. Your safety is very important to us. As with all stays at Lorella, please ensure you complete our Sign Out form before you begin your adventure from the homestead, so that we know who and where to look for, should you not have returned to the homestead 24 hours after your estimated return date. Don’t forget to sign back in when you do come back from each trip! Watch for the rock bars and sand flats at low tide. Tide timings are available from the homestead. Watch out for the tides! If you have a small boat there will be no shortage of places to slide your tinny down the bank and into the water. There is a launching area on the Rosie River about 13 kilometres from the mouth of the river. Watch out for the nasty rock bars along the Rosie River! Along the Wuraliwuntya (Secret Fishing Spot) there is a natural landing where you can launch your boat. You can also launch on the beach at the mouth of the river. ROSIE CREEK FISHING CAMP – For the serious adventurer! Nearly 20 years ago my family pushed the Rosie Track through to the beautiful, unfished and pristine Rosie Creek and up until recently it has always been our most popular (and successful!) fishing spot. The Rosie Fishing Camp and boat ramp is located about 13 kilometres upstream from the mouth where the Rosie meets the sea. The spectacular river Rosie is boiling with life offering a huge range of fishing from the spectacular Pandanus lined fresh water billabongs right through to the Gulf of Carpentaria’s tropical offshore reefs and rock outcrops that attract a vast range of reef and game fish. SECRET FISHING SPOT (WURALIWUNTYA) – For the explorer fisherman! After owning Lorella for nearly thirty years, we have, at last, forged a track to probably the most remote piece of coastline in Australia. Up until recently we had only been there once in a helicopter, and a few brave souls half carried their small boats down the crocodile infested Wuraliwuntya creek to its mouth at the coast, on the Gulf of Carpentaria. Now when we say “creek” you might envisage a water course just a meter or two wide, but by the time you get to the coast, it is over 200 meters wide and an anchorage for quite large vessels, and beautiful sandy beaches. The track splits from the Rosie Track and heads north where it will eventually join and run along a river. This area is untouched and Mangrove Jack heaven! Travelling along the river you will find some beautiful camp spots, places to slide your boat in and eventually make your way out to the mouth of the river and its pristine coastline and beautiful sandy beaches. There are sections of this river and the Gulf that on a low tide will require difficulty in navigating due the shallow water and exposed rock bars and sand flats. Freshwater fishing is popular at Lorella and there is a huge choice of fishing opportunities within the hundreds of kilometres of creeks and freshwater ways. Snapping Handbag, Drum Flat, Eagles Nest, and Spot X are just a few to mention. Some of the fish you are likely to catch in the fresh water include Barra, Mangrove Jack, Black Brim, ox eye hearing, perch as well as Redclaw and Cherabin. With 1 million acres of remote wilderness to discover and hundreds of kilometres of 4WD tracks accessible on Lorella, it has become essential for us to stock Diesel and Unleaded fuel at the homestead. We do stock fuel… as emergency only and top up only to allow for our customers to make the most of exploring Lorella while you are in the region. But we are expensive due to the fact that we have to buy it retail meaning we pay bowser prices and then have to transport fuel in 1,000 kilometres… So although it is virtually at cost, the price is reflected accordingly. Lorella Springs runs the entire campground and operations on solar batteries and a small silenced generator, for a few hours a day. We have chosen this to keep the campground pristine and peaceful for everyone to enjoy Nature and her surrounds. In the main homestead campground we have a NO generator policy. However, we realise that people need power. This is why we offer a separate area on the campground where people may run quiet generators – with a policy that all generators on the Generator Area must be off by 7:00 pm. Lorella Springs does not supply power sites. However, if there is a problem requiring health please let us know and we will try and help if we can. For the last few years we have had a chopper based at Lorella Springs during the Dry Season – and it is still a success every year! Scenic joy flights are available. Enjoy spectacular escarpment landscape from the skies, through sheer and deep chasms and gorges as well as the spiraling ancient pillars of the breath-taking “Valley of the Mazes” and the popular Lost City rock formations. 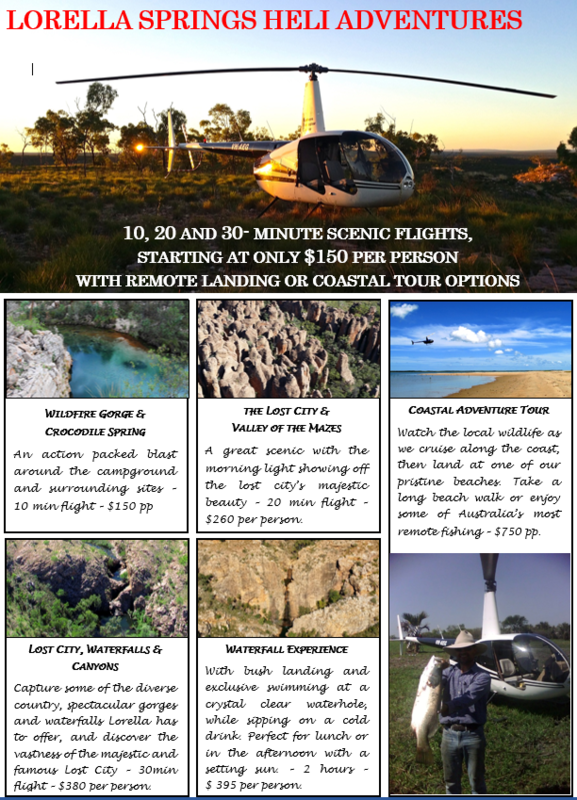 Or take a chopper ride and discover estuaries, creeks and some of the most remote untouched coast line and fishing in Northern Australia. Download our Helicopter Flyer for flight options, or visit our dedicated HELICOPTER page. Accommodation: several options are available: unpowered camping and caravan sites, bedrooms, deluxe rooms and air-conditioned cabins. Bar and meals: yes we do have a licensed bar which is open all day from 10:00 am, and we serve yummy meals for breakfast, lunch and dinner. Camp fire and camp kitchen: our campfire pit is always on and available for you to use with our camp ovens. Alternatively, feel free to use the camp kitchen (to be added during the season 2018). Kids’ area: for our younger guests we have the Kids Pool and Jungle Pool. Other children toys are available in the office on request. A trampoline is also available next to the office – adult supervision required. Television: whether you want to watch the latest footy game (or the latest episode of Home and Away! ), yes we do have a big flat screen TV available in our communal area under the shed. We also screen movies every now and then, which everyone is welcome to join for free. Workshop: for basic or minor repairs. Minimum workshop charge applies. See the relevant sections further down for details about ‘Accommodation’, ‘Bar’, ‘Books’, ‘Bathroom facilities’, ‘Laundry’, ‘Meals’, ‘Swimming’ and also ‘Mechanical’ for use of our workshop. If you have thought about changing your lifestyle for a little while and would like to try something different maybe Lorella could be for you work-wise too! With such a large property, there is always something happening and we are always pleased to have some extra help. Whether you like or are good at cooking, building, mechanical, electrical or maintenance work, gardening, meet and greet, entertaining at the bar or general rouse about, as well as cattle work, we could do with your skills and experience. So if you’re up for trying the Lorella lifestyle and doing some volunteering during your holidays contact Rhett or Marie by sending an email to rhett.walker@lorellasprings.com and let us know how you think you can help. In return for the hard effort put in, we are willing to offer some attractive discounts on accommodation prices. See our dedicated page to BECOME A VOLUNTEER for more details. By now you would be aware that Lorella Springs Wilderness Park operates between the months of April and October included. This means that for 5 months of the year, Lorella is shut to the public while the rain takes over and the property can become cut off from the outside world. But that does not mean that Lorella is left by itself for that period of time. For the last few years, from the Build Up and all the way until we reopen in April the following year, we’ve been lucky to have some wonderful Wet Season Caretakers looking after the place during our absence. In all honesty this position will not suit all. But for the right candidate/s, this will be a once in a life time opportunity. Lorella Springs will be hot, very wet, and at this point in the year would possibly be up there as one of the remotest places on earth. The person or persons interested must be capable of spending long periods of time on their own and in isolation and would be able to handle extreme remoteness and being cut from the rest of the world for up to 5 months straight. It is essential that the person/s will have a very mechanical knowledge with the resourcefulness to be able to fix things and keep operations flowing until the dry. Also ideally, we are looking for a mature, independent and self-motivated man or couple to look after Lorella for the whole of the Wet Season – preferably candidates that have been to Lorella in the past, or will be spending some time there during this Dry Season, in order to get to know the place and the owners. The main objective is to maintain and keep a general eye over the main camp ground. Some of the duties that would be required is keeping the campground slashed and mowed, keep the machinery working, repairs and maintenance to fences and buildings, look after trees and plants, and be available in the office to take enquiries over the station phone as well as liaise with management. This may suit a couple solid in their relationship, as it may be put to the test. Through the wet season Lorella is very basic and RAW, running completely on solar and a small 2kva generator when there is no sun. Accommodation is very basic and may well be better suited to someone with their own van or accommodation. Included is phone and Internet access, basic electricity, television, kitchen, bedroom, bathroom and laundry facilities. There is STRICTLY NO HUNTING at Lorella, as all our wildlife and flora is protected. Strict penalties will apply. We have washing machines at the homestead which are only available to be used while our generator is running (usually throughout afternoon). The cost is $10 a load. Please see us in the office to get you started. Menus vary depending on the time of the year and on our supplies. Please book your dinner meal in advance with our office team. As Lorella is so large with close to 1,000 km of roads and tracks, like veins opening up this vast untouched frontier, it can be very easy to become disorientated or lost. There is a lot of signage around our Wilderness Park, however, it is very important to pay attention and travel at your own abilities. It would be a good idea to travel with GPS, maps of the region, and a satellite telephone for example. Not everyone is that well prepared – which is fine, because when you first arrive at Lorella you will be greeted by our friendly staff who will brief you about who we are and what we do, tell you about the latest To Do experiences and new places open for you to explore. We will also give you instructions as to where you can set up your camp and we will try to give you a vibe of our beautiful unique place by showing you a few pictures and videos of a few of the highlights of Lorella. And we will also give you some Mud Maps with a plan of the local area and directions to all the numerous places for you to explore during your stay. We ask that you look over the maps and information provided and once you are ready to begin your adventure, come and see us again in the office. This time, we will give you very detailed instructions and directions about where you want to go and more maps as you travel into new regions. Before you leave the main campground at the homestead, we will have you fill in our customer departure sheet (or “Sign Out form”) with details of where you are heading, when you expect to be back and how many people are joining you. This is for your safety mainly, as we would hate to have you lost somewhere in the middle of our million acre property! Make sure you also sign back in when you come back from your adventures and explorations, so that we don’t send the rescue team to look for you in the bush! In this harsh and extreme environment, things can and sometimes do go wrong. We suggest you travel well prepared with water, recovery gear, satellite telephone, shovel, tools, and lots of spares including at least 2 spare tyres. Your safety is very important to us. As with all stays at Lorella, please ensure you complete our Sign Out form before you head out of the homestead, so that we know who and where to look for should you not be back to the homestead 24 hours after your estimated return date. Don’t forget to sign back in when you do come back from each trip! There is also a basic workshop to help with little issues, just to try to keep you out of trouble and get you mobile again. Please note that there is a minimum workshop charge of $50 for all workshop use. Our merchandise selection includes: T-Shirts, Singlets, Stubby Holders, Stickers, USB Keys and Torches. See our Merchandise Flyer in this booklet for more details. Nudie Camp includes big shady trees, a beautiful camping area, its own bathroom facilities, and a private part of the spring flowing past, with cascading pools and safe swimming. By the way, we are still running a competition to come up with the best name for our naturist camp. We have had some really good names suggested so far. Please keep on with your suggestions! If no one is attending the office when you pop in, it’s only because we might be at the back still working hard… or just eating 🙂 Just ring the bell by the bar and someone will run to help you straight away! Anyone wishing to leave the campground before 7:00 am – whether to go out for the day, or if you are ending your stay at Lorella – please make sure that you visit our office on the night prior, so that you can get directions and advice for your day trip, or to check out. Lorella Springs is a pet friendly place and we allow dogs in the property, however, in recent times we have had many issues with pets, and so we are becoming more strict with pet owners. Dogs must be ON A LEAD AT ALL TIMES whilst on the homestead campground – NO EXCEPTIONS. When travelling around the property, your dog is free to run around in the bush, but please be aware of wild animals, in particular wild cattle and dingoes. We also ask that you keep your pet under control at all times, as you’ll be sharing the park grounds with many other people, including those who also have dogs. In addition, due to many issues with our hunting policy not being respected in our previous season, hunting dogs are no longer allowed at Lorella. Please note that animals are not allowed on beds inside our accommodation (cabins, safari tents, bedrooms). Swimming for dogs on the campground is not allowed except in allocated areas – see our office staff for details. Lorella does not offer power site on the main campground, as we operate everything with solar panels or our own generator, which only runs a few hours every day. As you may have experience yourself during a previous visit to Lorella, a lot of our guests arrive to stay with us for one or a couple of days, and end up spending weeks sometimes exploring our property and enjoying the unique lifestyle of holidaying at Lorella! To make sure you don’t starve on our property once you have run out of supplies, we do offer a few food and general supplies in the office at the homestead. These are mainly basic with frozen or tin food, but also bathroom items as well as basic fishing gear such as lines and hooks. As the name suggests, Lorella Springs was originally named because of its many beautiful natural water sources – with countless springs that bubble up from the ground, including some hot water springs. Huddled at the base of the Tawallah Range is the beautiful natural, crystal clear, hot thermal spring, bubbling and pushing its way out from underground, cascading thousands of litres of water from this pretty Pandanus lined rock hole in the gap of the ranges and flowing straight through our picturesque campground. If you are looking for something a little more challenging than soaking in hot water, how about some waterfalls, rock pools or plunge pools, gorges, lakes, billabongs, creeks or swamps? There is literally water everywhere at Lorella! There are possibly more safe swimming holes here than across most parts of the Top End of Australia. However, don’t think you can swim in all of them, especially rivers and in the sea along the Gulf coast or you might soon realise that you are sharing the water with the local wildlife… because yes, salt water crocodiles and sharks do inhabit this region of the world! Therefore, it is very important that you pay attention to which of our Lorella water places are safe for swimming and that you DO NOT enter water that you are unsure of or have not been told are safe. The water at the main Homestead campground is pumped from the head of a beautiful hot water spring. This water is very good for drinking and we also provide taps around the campground that are fine to use to fill in your water tanks. If doubtful, we suggest you boil the water for your own peace of mind. Note: Please be considerate with your water consumption and help us preserve our water supply. Do not use any soap or chemicals in any of our water ways. Between the months of August and November, car washing is not permitted on the campground. Please wash your car at creek crossings – water only, no chemicals allowed. The Northern Territory only has two seasons: a wet and a dry. It is unpredictable, but usually we shut down Lorella on the 1st of October, which is when the Wet is moving in. We then re-open on the 1st of April. This will always depend on how the wet season has been and if it is dry enough to get into and about Lorella. From Easter time onwards it is always a beautiful time to get to Lorella as the weather is just drying up and cooling down. Waterfalls and swimming holes are flowing and looking stunning… and we are opening up our new tracks for the season, so you can help and experience the rugged Lorella. + June – July – August: The Dry season. The weather is pleasant, no rain, the roads are all drying out allowing easier access. This is a popular time, with mid-year school holidays, people leaving the south of the country and heading north chasing the sun. This is a great time to sit around the communal fire, socialise around our great open bar, swim in our hot water springs all night long and really enjoy the outdoors. By now the weather is starting to warm up. Our waterways for swimming are not so pretty, but the fish are really starting to come back on the bite again after the cooler weather. This is a very popular time of the year for fishermen chasing the elusive Barra. Although we try hard to protect our clients from death, injury, maiming etc (!). you must be fully aware that Lorella is an extremely remote area and does not offer the normal safety and protection which is found in cities or even country towns. Any visit or undertaking here is not without its inherent risks, and YOU accept FULL responsibility and hold us safe from any actions by yourself or Third Parties on your behalf. Lorella is such a big property that some of its local inhabitants may never have seen human beings before, therefore they might not be as welcoming as your friendly hosts when/ if you do encounter them on your travels. These include in particular crocodiles, sharks, stingers, snakes, spiders, scorpions, insects, bulls, and buffaloes as well as wild animals such as horses, dingoes and pigs. All wildlife on Lorella is protected, so please do not put yourself in a dangerous situation and try to enjoy Lorella’s wildlife through the lenses of your camera or binoculars! In addition, You will be in an area that is known to have risks from cyclones, drowning from too much water, dying from lack of water, falling rocks, falling from rocks, falling from vehicles and many, many other dangers too numerous to mention. You will be 1,000 km from Darwin hospital, with little or no communication with the outside world. All information is supplied in good faith as at 1st March 2016. We reserve the right to change information and prices without notice. Please also see our Terms and Assumption of Risk Conditions.